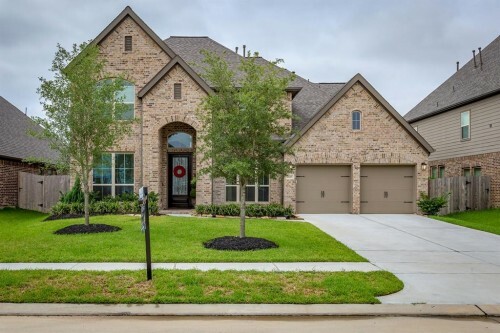 Gorgeous 2017 5 bedroom in Cypress Creek Lakes - Beautiful 5 bedroom Perry Home only a yr & a half young! Popular mother-in-law floor plan with Master & second bedroom on 1st floor! 4.5 baths, 3 car tandem garage, formal study, media, & game room. Nice open kitchen with butler's pantry and breakfast room with charming window seating. 2 story family room with cozy fireplace. Cute mudroom nook for backpacks and shoes. Master bathroom has double sinks, garden tub, seperate shower, & 2 closets. Backyard with large covered patio. Lots of natural light. Outstanding recreational amenities! Award winning Cy-Fair ISD Schools! Front door faces EAST! Great home in a Great neighborhood!